How about a Twill Label? Twill is a type of weaving usually done with lightweight cotton fabrics. It’s distinctive diagonal pattern is durable, super soft and won’t irritate the skin. There are many options of cotton twill including organic labels for eco-friendly clothing manufacturer or designer. 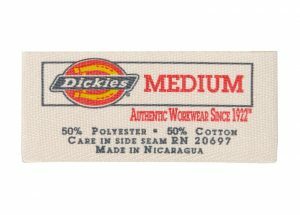 We also have natural flat polyester flat labels that look and feel exactly like natural organic flat cotton; yet, these labels are easier to wash and tend to last longer.